The ability to diagnose malaria, schistosomiasis and African sleeping sickness can be the difference between life and death for people afflicted with those diseases. And while diagnosis is easily done with microscopes, in many parts of the world, lack of access to these tools means these diseases are often misdiagnosed and patients go untreated. What is the solution? A $1 origami microscope, of course, called a Foldscope, that can be shipped and used anywhere. The new, media-rich e-book from QUEST, Engineering Is Diagnosing Diseases with Origami Microscopes, tells the story of how Stanford University bioengineer Manu Prakash and his colleagues designed a lightweight, inexpensive, robust, paper microscope in order to help people in developing countries and remote areas diagnose diseases. The book explores optics and how microscopes work–including the Foldscope–through video and animation, and shows how Foldscopes are inspiring students around the world to ask questions and make discoveries. It also contains a career spotlight video of a graduate student who uses microscopes in his research on heart cells. 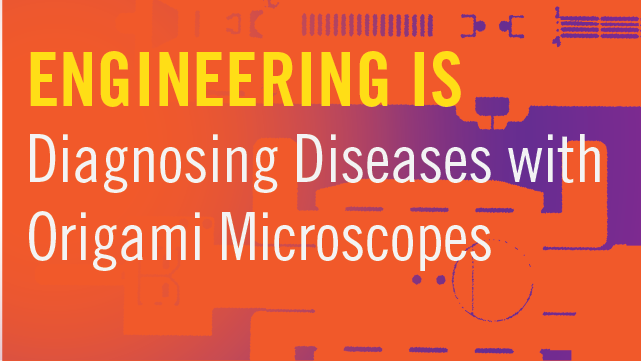 Engineering Is Diagnosing Diseases with Origami Microscopes is the third e-book in our Engineering Is… series and is available to view on your computer, tablet and smartphone, for free. You can find links to all of KQED’s e-books at kqed.org/ebooks. Discover how engineers developed a $1 paper microscope to help diagnose diseases in remote areas. Prev What Would You Explore with a Foldscope? Next How Smart Should We Allow Robots to Get?